Yerba Mate Canarias is a Pure Leaf Yerba Mate produced in Brazil, with a traditional flavour. 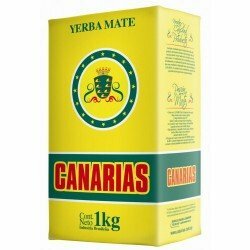 It is Uruguay's most popular and most consumed brand of Yerba Mate. Canarias is produced in Brasil for the Uruguayan market. Its is a pure leaf blend, very finely cut leaves and polvo (powder). Canarias is known for its strong unique flavour. For the best experience drink yerba mate the traditional way. Use a spoon shaped bombilla from Brasil or Uruguay which is made for this type of yerba mate. Discounts available for 2 or more packets.